President Trump’s speech at a campaign-style rally in Melbourne, Fla., was filled with a number of dubious claims. 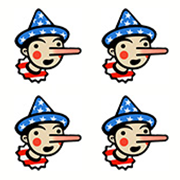 Here’s a quick round-up of his rhetoric — and the facts. We will examine these statements in the order in which he made them. It is unclear what stories Trump is referring to here, but mainstream news organizations do not publish articles with “no sources” and certainly do not “make them up in most cases.” That is grounds for firing. Certainly, sources can be misinformed, and respected news organizations strive to correct or update stories if a mistake has been made. It is worth noting that the Trump White House is often very slow to respond to requests for comment. Trump selectively quotes from Jefferson here, who, for most of his life, was a fierce defender of the need for a free press. When Jefferson wrote to 17-year-old John Norvell, urging him to avoid a career in journalism, he was embittered by reports spread by his political opponents that he had slept with Sally Hemings, one of his slaves. Today, most historians believe she was the mother of six of his children. Trump appears to be referring to a tape obtained by The Washington Post and other news organizations of GOP lawmakers expressing fears about how they would accomplish the goal of both repealing the Affordable Care Act and covering the estimated 20 million people who have gained heath insurance under the law. The president sets himself a very high bar of “better health care at a much lower cost.” Most health-care experts believe that will be very difficult to accomplish. Trump appears to be combining two disputed figures — 28,000 jobs for Keystone XL and 12,000 for the Dakota Access pipeline. We have looked closely at the Keystone numbers, and the same methodological issues appear to apply to the Dakota estimates. The actual number of Keystone construction jobs, for instance, is 3,900 on an annualized basis — and other jobs have already been created (such as for building high-strength line pipe.) In the context of the U.S. economy, which just in January added 230,000 jobs, these are not many jobs. Trump is exaggerating here. Boeing had only a $170 million contract to begin designing a replacement for Air Force One, and the cost of the project had not been set. The Defense Department’s five-year plan indicated a cost of $2.9 billion over the next five years for design and development. It’s logical to assume at least $1 billion more in additional expenses to complete and procure the aircraft. An estimate of $4 billion — for design, testing and manufacture of at least two jets — was not completely out of line. But the budget was subject to approval by Congress and the actual design of the aircraft. So Trump is taking credit for cutting a price that had not been negotiated yet. Trump is referring to the Lockheed F-35 program. 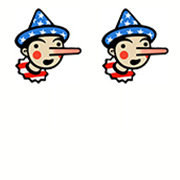 Again, he is taking credit for something that had already been negotiated, a claim that had previously earned him Four Pinocchios. The Pentagon had already announced cost reductions of about $600 million before Trump met with Lockheed’s chief executive. “Inner cities” is not a category by which crime is measured, and Trump often uses this term to refer to large, urban cities. In 2016, there was an uptick in the homicide rate in the 30 largest cities in the country. One outlier city — Chicago — was responsible for 43.7 percent of the total increase in homicide rates in 2016. Overall, violent crime is on a decades-long decline, since the height of the crack cocaine epidemic in the early 1990s. The homicide rate in the 30 largest cities also increased in 2015, but the two-year trend does not indicate the return of a crime wave in “inner cities.” Crime trends can randomly fluctuate year to year, and criminologists consider the data over much longer periods — at least 10 to 15 years — to draw conclusions about trends. Trump is referring to Syria, Iraq, Iran, Sudan, Libya, Yemen and Somalia, all of which were subject to the executive order that ordered a travel ban on residents of those countries. Four of the countries were identified by Congress, in a bill signed by Obama, and then the Obama administration included three more. But Obama — and Democrats in Congress — wanted greater visa scrutiny of people who had traveled to those countries. When given a chance, the Obama administration specifically rejected the citizenship-based restrictions of the kind that Trump ordered. So there were significant differences in the approach. This was a very strange comment. Nothing had happened the night before in Sweden, as Swedes (including former prime minister Carl Bildt) quickly noted. This is false. The vetting of refugees is careful and takes about two years, including FBI screening, Department of Homeland Security interviews and extensive security and background checks. Trump cherry-picks data from Arizona, the state hit the hardest by 2017 premium increases under the Affordable Care Act, or Obamacare. The average increase for the second-lowest-cost silver plan (which is used as the benchmark to calculate government subsidies) is 25 percent. A few states, such as Indiana, will actually see a decrease. Trump is exploiting general public confusion about the Affordable Care Act. The law mandated some broad changes to the health-care market, including cost savings in Medicare. But, according to the Congressional Budget Office, most Americans (155 million) get their insurance through their employer and would have noticed little, if any, change, except that their benefit package may have gotten better. Premiums in those plans have increased year after year, as they always have, but at a slower rate than in the 10-year period before 2010. The premium increases cited by Trump relate to the 22 million individual and small-business policies sold on the exchanges or directly to consumers. That’s significantly smaller than the employment-based market — one-seventh the size. As noted before, about half receive tax subsidies, which help make the premium affordable. To put it in context, the number of people affected by premium increases is just one-fourteenth the size of the employment-based health-insurance market. Still, the individual marketplace exchanges have been under pressure because the mix of people signing up for health care under plans offered on the exchanges has been unhealthier than expected. The feared individual mandate has not had the expected result of persuading people to buy insurance, with younger and healthier Americans apparently more willing to pay a $695-per-person fine than sign up for health care that they think is too costly. So the mix of people in the insurance pools have tended to be people who have chronic illnesses and thus require more care and frequent doctor or hospital visits. The risk pools are also why insurance companies have sought higher premiums and the bigger deductibles. Some of the initial steps taken by the Trump administration have helped worsen the problems in the individual insurance market — allowing Trump to create a self-fulfilling prophecy. "Thomas Jefferson said ‘nothing can be believed which is seen in a newspaper. Truth itself becomes suspicious by being put into that polluted vehicle.’"
in a speech in Melbourne, Fla.